Fritz Scholder was born in Breckenridge, Minnesota in 1937. He was raised in Wahpeton, North Dakota, South Dakota and Wisconsin, attending public schools with Anglo children. In the 1950s, Scholder studied with Wayne Thiebaud, a pop artist. Thiebaud escorted Scholder into the contemporary art scene, introducing him to Abstract Expressionism and presenting him with early opportunities to showcase his work. Scholder’s style was that of bold colors and generous brushstrokes. After graduating with an MFA Degree in 1964, Scholder became an instructor in Advanced Painting and Contemporary Art History at the newly formed Institute of American Indians Arts in Santa Fe, New Mexico. During this five-year period his career quickly formed. Figure 1. 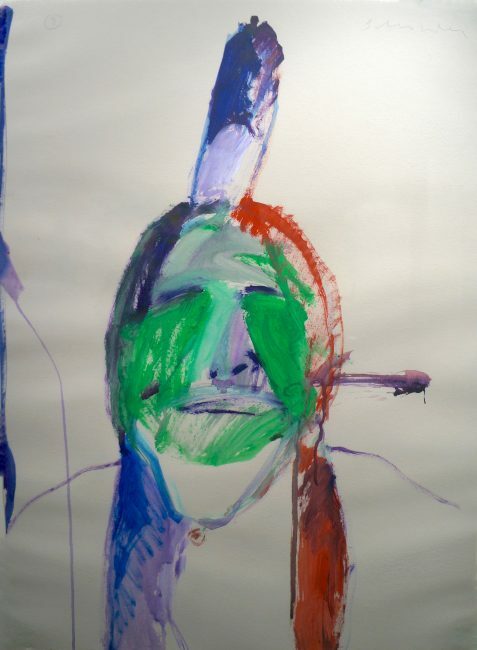 Fritz Scholder, Indian No. 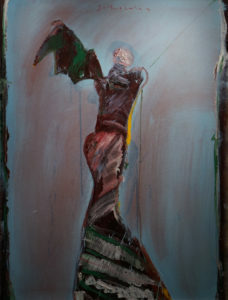 1, 1967, oil on canvas, 20 × 18 in, courtesy of the collection of Anne and Loren Kieve, © Estate of Fritz Scholder. Figure 2. Fritz Scholder, The American Indian, 1970, oil on linen, 42 inches x 60 inches, courtesy of the National Museum of the American Indian. During his experience teaching, Scholder was enlightened on the cultural alienation of American Indians, which motivated him to pursue it as a theme for his work. 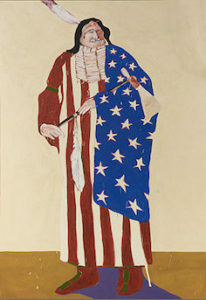 In 1967 he began the Indian series that maintained his bold style of Abstract Expressionism and Pop Art, while introducing depictions of the contemporary lifestyle of American Indians (see figure 1). The convention for Indian American art was longstanding, and art students and artists alike only depicted Indian subjects in a strictly traditional manner that was flat and pictorial. The subject was rendered romantically, which maintained an aura of sentiment and consistently relegated living Indian Americans to the past. Scholder set out to remove the picturesque style that masked current realities. With humor he presented clichés, that is current Indians set in contradiction between ceremonial dress and contemporary lifestyles (see figure 2); this effectively drew attention to the issues of self-alienation and the enforced alienation of these citizens. This abrupt invention of the avant-garde Indian in art was received by both mainstream and Native American audiences as shocking; their expectations were bulldozed by Scholder’s distortion of the figure and bright colors used for skin and figural elements. Further controversial were inclusion of the American flag, beer cans and arcade games. He dripped and smeared paint, as well as scraping top paint layers (see figure 3). Through direct and intense style, Scholder achieved his ambition to help viewers consider Native people in a new way. 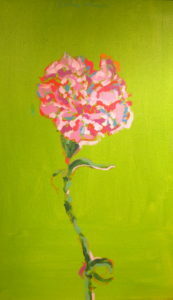 Indeed, the series brought him acclaim as he cultivated the theme for over ten years. 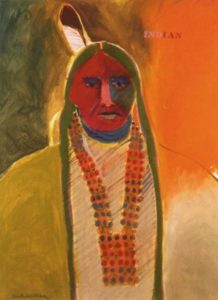 Fritz Scholder’s paternal grandmother was a member of the Luiseño tribe of California’s Mission Indians, meaning he was one-quarter Indian. Stated many times by the artist, Scholder did not consider himself an Indian. Art discussions ensued on whether Scholder should be categorized either as an Indian talent or a social apologist. Scholder stated, “I am a non-Indian Indian, I do not feel the pull of the dichotomy of two cultures.” His role as an art professor spread his pioneering approach to students, which paved new options for the future of Indian American art. After developing the series for ten years, Scholder pursued the American Portrait series (see figure 4), the Flower series (see figure 6), as well as dabbling in sculpture (see figure 5). 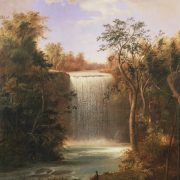 All retained the singular, centered subject, while the latter was concerned with beauty rather than cultural commentary. Scholder is celebrated today for pulling Indian American art into contemporary styles, modifying possible representations for other artists that will remain indebted to Scholder. View the Biography of Fritz Scholder.